Located in Chicago, Everede Tool Company has been manufacturing quality cutting tools since 1932. 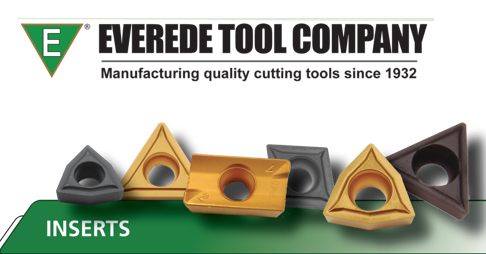 Everede Tool Company manufacturers standard and special indexable cutting tools including Boring Bars, Countersinks, Chamfermills, Counterbores, Inserts, and more. Everede made the first inserted boring bar, in the 1940's. 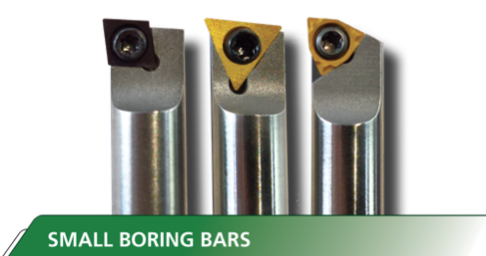 Having the largest selection of screw-on boring bar in the industry, Everede now wants to be your “one stop shop” for boring bars and it has recently added hundreds of products to its ANSI Program. Along with Preferred Distributors, Everede is working closely with some of the world's leading manufacturers in the fields of transportation, aerospace and defense. Everede wants to create value for customers by building tools that reduce cycle time, combine processes, and are delivered in a timely manner. CV7 - PVD TiN/PO5 (gold) coating. Ideal for light ﬁnishing steel applications. CVM2 - PVD TiN/K10 (gold) coating. Ideal for stainless steel ﬁnishing applications. TL120 - Multi-layer PVD TiAln/K30 (black) coating. For tool steel, 400/500 & PH series stainless, gray/nodular cast iron and high-temp/high-strength alloys in high heat applications at higher speeds . 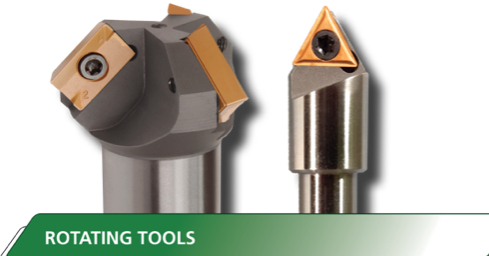 Works best in dry machining applications. CS7 Micro-grain P05 ﬁnishing grade for steel. CS6 Medium grain P30 roughing/semi-ﬁnish grade for steel with minimum hone. 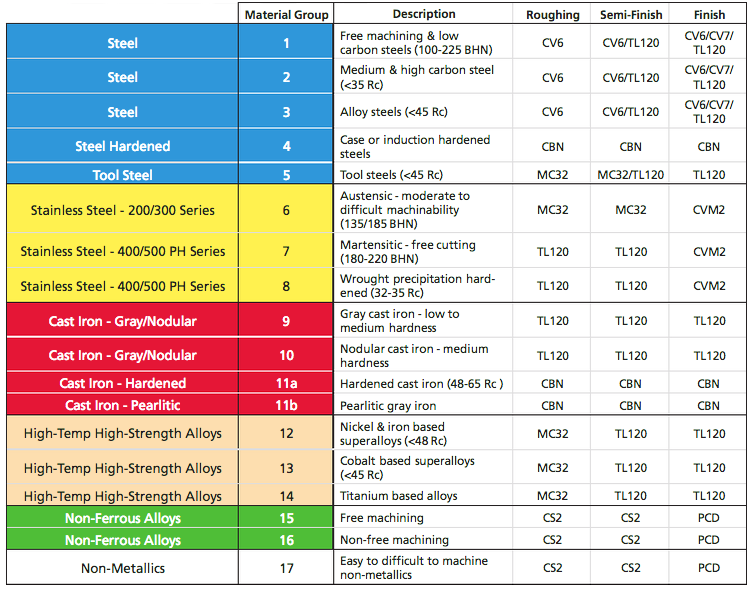 CM2 Micro-grain K10 semi-ﬁnish/ﬁnish grade for stainless, cast iron and high-temp/high strength alloys. CS2 Fine grain K20 roughing/semi-ﬁnish grade for non-ferrous application. CT7 Cermet P05 steel, stainless and cast iron ﬁnishing application. 7°, 11°, 15°, ANSI Series Boring Bars including SCLCL & SCLCR bars with both Alloy Steel and Carbide Shanks for holding CDHB and CCGT inserts. 0°, 5°, 7°, Everede Series Boring Bars offerend in Alloy Steel, Heavy Metal and Carbide Shanks for holding CDCD, CDCC, and CDCH inserts. All bars have a 5° Positive Axial Rake. 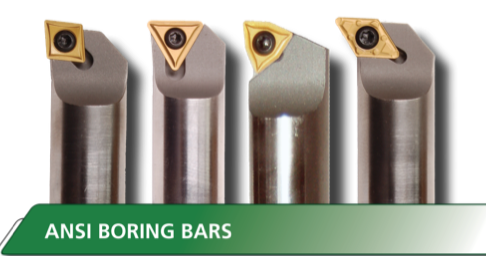 5° angle bars for facing and through hole boring.